Krishna Vinod is a Delhi based singer and design student from Kerala. In 2003, she began her vocal training in Carnatic Music under the late Sri Reji George for 3 years. She later continued her vocal training at Performer's Collective under Mr. Yeashu Yuvraj who helped her grow tremendously and earn a Level 6 Performance Diploma from Rockschool London. 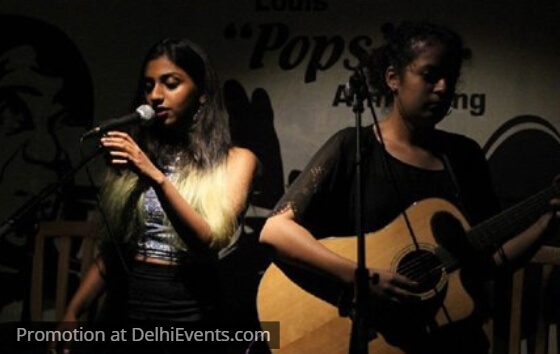 Krishna loves covering a variety of genres including indie folk, jazz, neo soul and R&B. Some of her major influences are Amy Winehouse, Etta James, Lianne La Havas, John Mayer and Norah Jones. Prakriti Nanda is a guitarist and vocalist whose playing style is heavily influenced by guitarists like John Mayer, John Butler, Ben Howard, SRV and more. She loves to harmonise and experiment with percussive guitar while giving an original flavour to existing songs.